Today, we took a late afternoon walk in Kyoto. 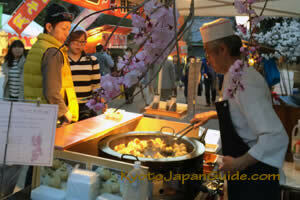 As usual, we started off in Gion, then walked to Chion-in Temple’s Sanmom Gate, and into Maruyama Park for an early evening stroll through the food stalls to the centerpiece of the park, a huge, old weeping sakura tree. 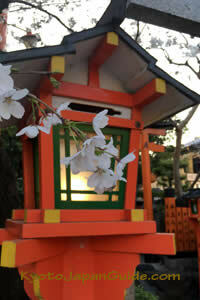 We walked back to Gion through Yasuka Jinja Shrine. 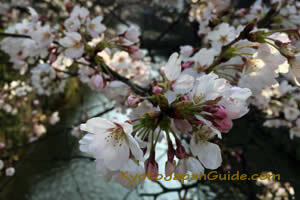 Here is our Kyoto sakura report for today. For most of our train travel between Kyoto and Osaka, we use the Keihan Line. I always pay attention to the posters that Keihan puts up during the spring sakura season, and in the fall during the autumn leaves season (“koyo”). These posters are changed every day, or two, and show the current conditions of the spring blossoms, or fall leaves, on the trees around the Kyoto/Osaka area. 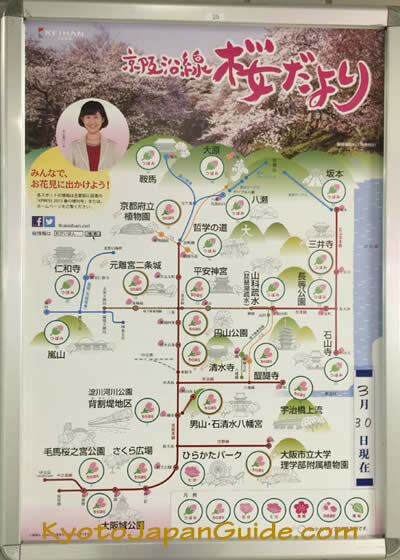 This is the Keihan sakura update poster for March 30, 2015. It shows most places in the area at around 30-40% of their full bloom. I found this to be a little behind, today, depending on the area. First, we walked down my favorite little street in Gion. 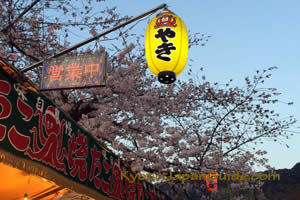 Correction: In my early Kyoto Sakura Reports this season, I have called this street “Shirakawa-minami Dori”. That’s what it is called on some maps, including Google Maps. But the local sign on the street calls it “Tatsumi-dori Street”. It connects Kawabata Dori along the river with Shinbashi-dori Street. At the intersection of these two streets are the famous Tatsumi-daimyojin Shrine and the Tatsumibashi Bridge, that you can see in my other post. I will call this street Tatsumi-dori Street from now on in my posts. I love this street and the small stream that runs beside it, next to some small restaurants in traditional wooden buildings. 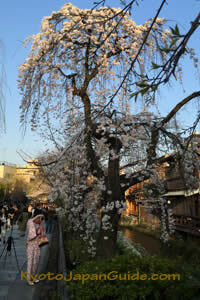 The sakura trees along this street and stream were around 70% in bloom this evening. They will be at their peak in the next day or two. 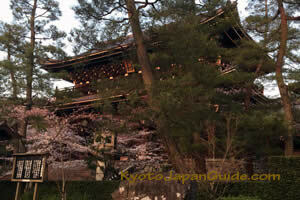 We then walked to Chion-in Temple. 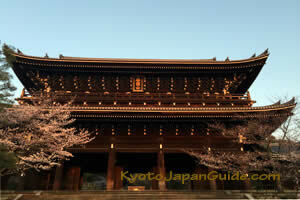 This temple is on a large compound of beautiful, large wooden buildings, including the massive Sanmon gate. This gate is similar to the huge gate at Nanzenji, a little to the north of here. Both gates are very impressive wooden structures built with huge wooden columns. There are a few sakura trees outside the gate that were between 30-60% in in bloom this evening. Even these trees that are right next to each other are in different stages of blooming. 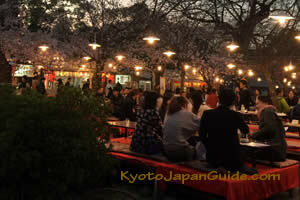 Then we wondered through Maruyama Park, between Chion-in and Yasuka Jinja Shrine at the edge of Gion. 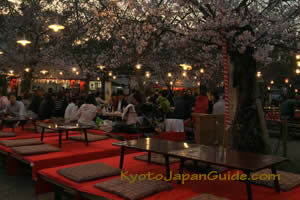 The evenings during sakura season are like a festival here. 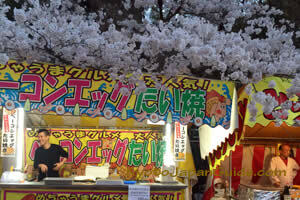 Many “yatai”, or food stalls, sell their fresh cooked food here under the sakura trees. 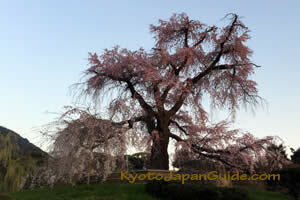 At one end of the park is a huge, old weeping sakura tree that was 80% in bloom this evening. I love this old tree! Thank you, everybody, for reading our post. 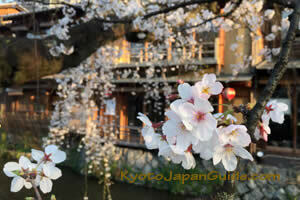 Please leave a comment and tell us what you think, or how you have been spending your sakura season! We’ll talk to you again, tomorrow.